My Lan, a singer who has lost her voice, often thinks that "there is no such thing as ghosts." When she is assigned to attend an art school to complete a special director training course, she is requested to move to the upper floor of the school throughout the course. From then on, My Lan is constantly haunted by mysterious beings that alters her believe in the existence of ghost. So the film opens in a hospital where you meet a new nurse working her first night shift. You also meet an old male hospital attendant I guess you'd call them and they've been asked to wheel a corpse out to the morgue which for whatever reason is located in another part of the hospital, it's far enough that they have to wheel it across an open area that looks like a park. Of course the park area isn't well lit, looks creepy and for whatever reason a light mist/fog seems to be hanging in the air. Oh yeah, from the first moment the old attendant meets the young nurse he's been talking about creepy things like ghosts and hell and such. Then right in the middle of the park the old man has to take a pee and since he's put the fear of ghosts in her she won't let him go far, so he goes near a tree about 15 feet from her. He also tells her to look away which she does but decides to look in the direction of the corpse. He does his thing while talking to her but then suddenly stops as he spots something in the trees. He freaks out and goes quiet. The nurse notices this and starts calling to him and when he doesn't answer she looks in his direction to find him gone. She heads over to look but he's nowhere around. She starts to panic. She heads back to the corpse and is startled by the old man. The old man that claims that someone might be watching them so both decide to move as quickly as they can and take the corpse to the morgue A.S.A.P. But the gurney won't move, it's stuck. The old man bends over to check the wheels and notices a pair of legs behind the gurney but as he stands it disappears. Again they try to drag the gurney but it won't move and this time both ask the other to let go of their hands. Turns out the hands that are holding them back are the corpse's. The both scream and run for it. End. Next up we're taken to a college or a university where we meet a bunch of theatre students practicing a scene when they're interrupted by a teacher who's brought a new member of the staff. She's there to take over the directing of the play they're in in order to get her degree in directing. The kids upon meeting her give her the third degree to get to know her. When she tells them that she's temporarily staying in the theatre prop room on the roof of their school they start on her with the ghost stories famous around the school. In particular they tell her the story of a previous resident of the prop room who went missing one day only to be found by a couple of janitors in the water tank. Of course she's dead but the interesting thing was that her body has yet to decompose, her eyes were wide open and she's got a smile on her face. Unfortunately for them their attempts at scaring her don't work. So now we go along with said wannabe theatre directing as she spends her first night there and of course nothing happens. Then we see her clean up the prop room and the bathroom which also happens to be on the roof. Again she spots nothing but we're treated to some ghostly feet as she drops her soap and it slips below the door and outside. The second night as she washes her face instead of foaming up with facial wash she smothers blood all over her face. Then when she grabs the soap to wash it off she sees that someone has carved the words, "I will see you at midnight". Of course being the sort to not believe in ghosts she is furious and barges out the bathroom and into the pouring rain and starts to scream at no one telling them whether they be human or non-human that she doesn't appreciate the gags and that she's not afraid. Later back in the prop room she says a little prayer and goes to sleep only to awake in fright as she dreams about the female ghost that is supposed to haunt the prop room. Just then the lights go off. She manages to find a wicker lamp and light it. Just as she thinks things are normal she hears a singing. She begins to panic. She grabs the closest thing that she can use as a weapon and peeks through the slats in the door and as she does she sees a floating prayer urn which makes her panic even more. Then she hears a voice asking her to open the door. A female voice tells her that she's cold and wants to come in. A little back and forth happens and the voice comes up with enough reason for her to open the door which she does. So the girl, dressed all in white and has apparently been walking in the rain which has stopped quite a while ago, comes in and they talk. Then they sort out their sleeping arrangement. Both have a hard time of falling asleep and while they're talking someone knocks on the door. It's two of her students, the two that's been telling her about all the ghosts that haunts the school. They've come to apologize and take back the prayer urn. They also tell her that everything that's been happening to her has been a gag all along. She of course doesn't appreciate it but she tells them that she doesn't have the prayer urn, that the last time she saw it it was floating outside her door. Still they press her for it saying that she must still have it. So she calls on her new room mate to back her up but as she stands there asking her room mate to back her story the kids tell her that they don't see anyone there. That she's talking to thin air. So she panics and runs. All of them do. As she runs down the stairs she trips and falls. The next time we see her she's in the hospital with her head all bandaged up. All her students are there including the department head which introduced her to the kids. But as she looks around another person walks in, it's the girl ghost except that she's not a ghost. So now she knows that it's all been a prank and that she's almost lost her life over it. Later on we follow the girl who played the part of the girl ghost. She's at the club but starts to feel dizzy and nauseous so she asks for her boyfriend to take her home. On the ride home she tells him that she thinks she's pregnant. In the ensuing argument he forgets to concentrate on the road and runs into an old lady walking by the roadside. All end up sprawled and bleeding on the road. He manages to get up and starts walking towards his girlfriend but just before he gets to her he spots an oncoming bus. He panics and gets on his bike and makes a run for it. Back home he cleans himself up and heads to bed only to be woken up by a nightmare. As he tries to calm down he hears a voice outside his bedroom door. It's his girlfriend who has somehow managed to drag herself back to his place. The next morning as she sleeps alone on the bed she is woken by the sound of a little girl sleeping next to her and calling her mommy. She screams and calls for her boyfriend. For the next couple of days, both hide out at home afraid of being caught by the police. But they don't get much peace as he is haunted in his dreams by the old woman and she is haunted by the little girl. Then one day tired of hiding out and wanting some fresh air and food not prepared in the microwave they head out to dinner. 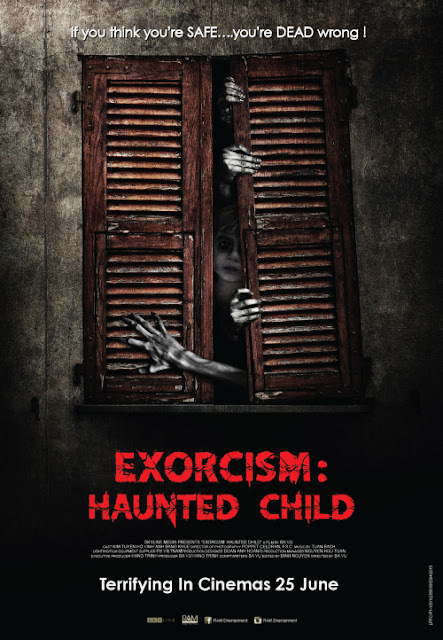 On their way back he becomes possessed by the spirit of the old lady and he tries to kill his girlfriend. When he finally gains control of himself they notice that they've stopped right where the accident happened. Both panic and immediately get on their bike. Back home he decides that he can't live with the guilt anymore and wants to go to the police to confess. The next day at the police station after he confesses the police officer tells him that his confession is correct in all but one detail. Just then another officer brings in another witness, the old lady. He freaks out and thinks she's a ghost but they tell her that she isn't. Then as after he's calmed down the officer tells him what actually happened. Turns out that that night even though the old lady's injuries were severe she survived because the bus that he say coming managed to take her to the hospital just in time. His girlfriend on the other hand wasn't so lucky. As the detective is telling him this in the background we see his girlfriend. She realizes now that she isn't part of the living. Then for whatever reason we are returned back to the opening scene where the gurney is stuck in the park. Turns out that the body on the gurney was her and that the ghost that scared the nurse and the attendant was her. She screams in agony and her loss and situation. The next time we see the boyfriend he's driving back from somewhere and his passenger is the theatre director wannabe. Turns out that what us audience has been seeing was just them remembering the girl and how they've impacted their lives. Also in the back seat is her ashes. He's taking it back to her ashes back to her family. As they talk they both hear a little girl laughing in the back seat which makes him slam on the brakes. They turn to see what's behind them. What they see scares them so much that they rush out the car and go running into the jungle. Then we get to see what they see. The box containing her ashes has opened and now her portrait looks right at us. As we slowly zoom into it the picture of her smiles. So my first Vietnamese movie and it's a horror. How was it? Yup my first Vietnamese language movie made in Vietnam by Vietnamese. I have no idea why I had to say that. Anyway, it was sort of interesting. Right at the beginning as the credits roll you see that the story was inspired by supernatural short stories which made me think that this was what the movie was going to be. A bunch of short ghost stories. But as you watch the entire thing you do feel like that's all it is but that the folks behind the movie decided that they were going to link it all together by having one character link it all together into a linear story.All the usual Asian horror movie tropes are present, the female ghost dress in white with long straight hair, the drowning, the body found by unsuspecting workers or unfortunate people, the unusual state of the body, the vengeful ghost, the child ghost, the remorseful accidental killer, and a few others. I think they've got everything covered. And it doesn't work. Also that linear storytelling also doesn't seem to work so well. The links between the story are tenuous at best. It makes sense only if you don't care about the story. Care a little bit and it starts going down the drain a fair bit. Also there are times when it seems the director can't decide whether he wants it to be a comedy or an actual scare your pants horror. You sit there laughing at things that maybe you shouldn't be laughing at or maybe not laughing at it the way you should. Am I making sense? Then there's the acting which seems more suitable for TV that it does on the big screen. It's a bit amateurish at times. The only acting I was sort of impressed with was by the wannabe theatre director. The rest not so much. Let's talk about the scary bits now. Like I said before all the Asian horror tropes are in use so pretty much all the usual methods to scare are there too. It wasn't bad. It was just more of the same but interpreted through a Vietnamese director. It was interesting. There's not much use of CGI most of it was done with practical effects i.e. make-up, lighting, etc. 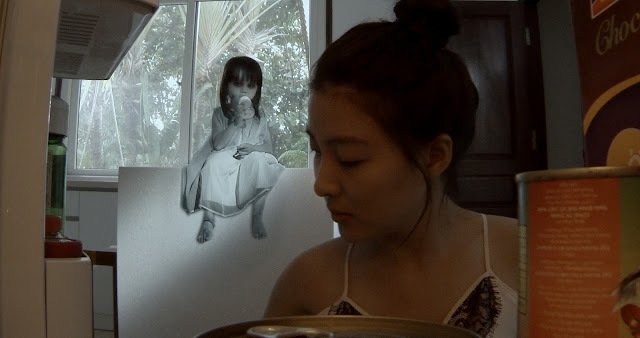 The only obvious CGI was done on the little girl ghost which was very obvious. What they've done is shoot her doing her stuff like lying down, walking, sitting, drinking her bottle and then passed her shots through a software that first turned her grey and then added effects on her skin and face as and when needed. Honestly speaking if this was a movie that came out of Japan, Korea or Thailand I would have been disappointed. But seeing as how it's come from a country not well known for its movie industry let alone in the horror category I have to say first that it's interesting and second that I was sort of impressed. There were some good moments in the movie but unfortunately the whole sort of brought it down. The story had it's moments but didn't work as a whole. The camera work was odd in some parts. The acting was not good but not bad and the lines that they had to work with felt like a sophomoric attempt. Or maybe that part was lost in translation. All in all, I'd say it was a good try but it still falls short. It's entertaining but only if you sort of keep in mind that this movie comes from a country whose film industry is still growing. But based on this movie I'd say it's growing quite well and I'd be glad to watch another just to see where it goes. Go watch this if you're a fan of horror and want to see how it's done by a Vietnamese team. Go watch this if you're a fan of new cinema. You'll get a few scares and you'll see it from somewhat fresh new eyes. I'd have to say this movie gets a 2 out of 5 for good effort. THANKS FOR THE PASSES KLIPS.MY!! AND THANKS FOR HOSTING US GSC CINEMAS @ NU SENTRAL!! The actual behaving wasn't great although not poor and also the outlines they experienced to utilize experienced just like a sophomoric try. Or possibly which component had been dropped within interpretation.